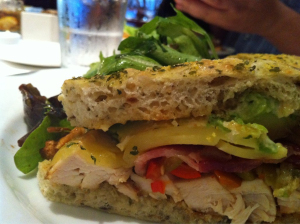 a chronicle of food: a sampling of the best captured memories of 2011. 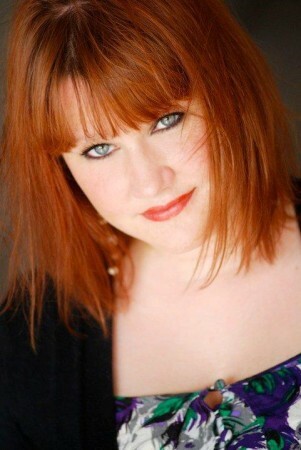 What is it that drives us to remember those meals? You know, the ones that we salivate over profusely, cause our stomachs to growl, and when we close our eyes, we dream of eating? And, I have done my share of eating this year. Regardless, there are days where I breathe food, or rather, where I associate those special times with certain experiences. We all have them. These are mine from 2011.
Who doesn’t love breakfast? When I was pregnant with the little girl, I would hallucinate about warm, newly baked bread, fresh squeezed grapefruit juice, and poached eggs. 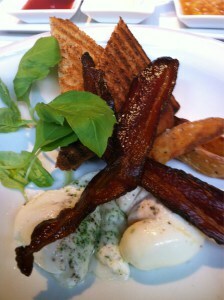 Chef Andrew Weissman of Il Sogno serves his eggs truffled alongside rosemary potato and hickory bacon. Il Sogno, besides being known for having some of the best coffee in town, also makes their own jams and honey lemon marmalade. 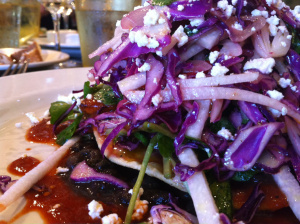 If you have not tried The Monterey in Southtown San Antonio, then you are truly missing out. Out of all the restaurants in San Antonio, you can count on El Monty to change up the menu on a consistent basis. One of my favorite food memories from the fabulous garden patio is from the Offal Tasting Menu. 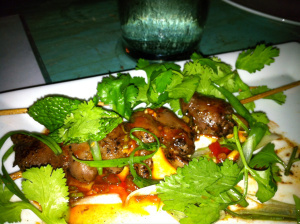 Chef Quealy served up chicken hearts, Korean BBQ style with a tangy kimchee sauce. I will admit, I am a sucker for offal. This dish was executed perfectly, not overdone, and not oversauced. Food trucks have become quite the distraction these days. One of the original food trucks in town belongs to Chef Jason Dady, aptly named the Duk Truck, which I associate with his expertise in duck confit. 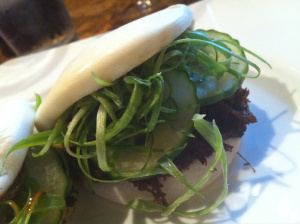 The bird is prepared in traditional confit style, pulled, and then arranged on a mantou bun with cucumbers. Doughy, plain, and light, the bun itself does not take away the flavor of the duck, and allows the cucumber to penetrate the comprehension of the dish. The Sandbar Fish House & Market, located at the Pearl Brewery, absolutely has the best seafood in town. Flown in daily, you can choose from oysters, sashimi, ceviche, and countless others. 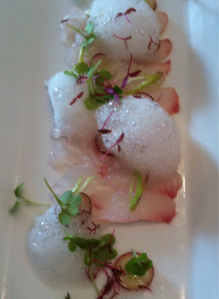 Chef Chris Carlson served up this halibut sashimi, complete with lemon foam, radish, and micro greens. 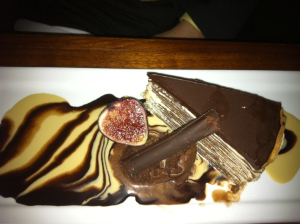 Now I am not one for tiramisu, but this dessert by Chef Bruce Auden’s Biga on the Banks gets a thumbs up from me. Rich and creamy, without the slightest sogginess, this particular dessert was one of my favorites this year. Now sometimes you must toot your own horn. This year, the sommelier and I participated in the San Antonio half marathon. 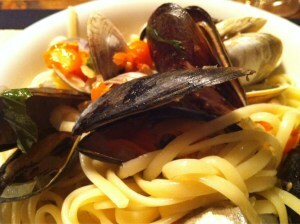 The night before, I prepared this delicious pasta with clams, mussels, and scallops in a white wine butter sauce. It was a great way to get our carbs in. On our sommvacay to Napa this year, we had the pleasure of dining at quite a few places. Market in St Helena provided a very pleasurable lunch, where I dined on farm fresh avocado, roasted red pepper, and free range chicken on homemade focaccia bread. The spring salad had farm arugula and pine nuts in olive oil and vinegar. Delicious. Bin 555 is a neat little restaurant tucked away in Artisans Alley in North Central San Antonio, and is also run by Chef Jason Dady. Probably my favorite charcuterie eaten this year was served here. 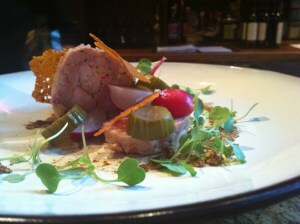 The rabbit charcuterie, complete with pickles, radishes, and micro greens laid in stone ground mustard. Presented beautifully, I felt as if we should be sitting in New York, LA, or Chicago. The marbling was flawless, the rabbit and micro greens blended perfectly with the mustard. Even the pickles and radishes were clean and fresh, local, and contributed to the essence of the dish. Every few years my mother’s family has a reunion in St. Marys, just outside of Shiner. This year we were served Janak’s sausage from Hallettsville. 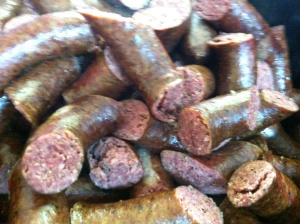 Old fashioned and hickory-smoked, this Czech sausage, made in Texas for generations, is the best you can find. This seafood tostada from Mustards Grill in St. Helena was worth every bite. Salmon topped with cabbage, black beans, and a red sauce eased my hunger and provided enough protein to make it through the rest of the day tasting wines. A surprisingly light dish, it also surprisingly paired nicely with the Chardonnay that the sommelier chose for lunch. The sommelier and I escaped to the garden patio of The Monterey on his 35th birthday, complete with hungry industry folks. Not only were we able to enjoy a reasonable priced Chianti (or two), but the highlight was a dessert that QuealyQ brought out himself. A chocolate dipped HoHo served with crystallized ginger and topped with sea salt. The mixture of sweet and salty fashioned quite a memorable experience. 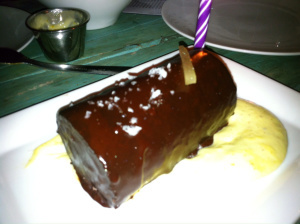 Now I wish I had pictures of our most memorable meal of the year, eaten at Cyrus in Healdsburg. I could explain the dishes in detail, even display our menu, but it just isn’t the same as seeing it in person. The tasting menu, the wine, the atmosphere: it rivals French Laundry in everything but price. There Cyrus has the floor. I can only say this: go there. You won’t be disappointed. I am hoping now that the little girl is getting a little older, we will be able to take more trips and create more food memories. Up for 2012: Italy. I won’t even hesitate. Bring on the new year! Cheers and much food happiness to us all.